Somehow I've managed to once again have a poor end to the season. What's made this one different to previous seasons is that it followed a poor middle of the season and a disappointing start to the season too! Okay, so I haven't had as many hours on the bank since November as I wanted, but the efforts I did make had brought me 0 fish on the bank since November too! A few evening sessions fishing for zander, a few of the same after barbel (in seemingly ideal conditions, too) and an all-day chub session all resulted in a single half-hearted bite and no fish hooked or landed. In February I escaped the horrendous floods by heading to a canal which manages to remain clear no matter what the conditions. It was a slow day during which I fished static deadbaits, wobbled deadbaits and lures, which all generated very little interest. Finally a float-legered sardine I'd cast tight to a reedbed was picked up and line was being taken fast. In my eagerness I rushed to set the hooks. If I'd taken a second to look and think, I would have seen that my float was disappearing behind a clump of reeds, causing an angle between the rod and the hooks. A few strides up the bank before striking would have alleviated this, but I had a momentary lapse of angling intuition and instead struck from where I stood. The water erupted beside the reeds as a very large fish pulled back. No sooner had my rod hooped over than the fish buried deep in the reeds, a few more kicks as I scrambled to get a better angle of pull and the fish was gone, leaving my hooks embedded in the Norfolk reeds, which eventually defeated my mainline. Bloody Norfolk reeds, over the years I've lost more tackle in them than in trees, or any other snag for that matter. Despite their thin, hollow construction they are remarkably strong and even 15lb mainline is no match for them if the hook has a firm hold. After that, I tried all sorts, went to see how other stretches of the canal were fishing and it became apparent that with one run, I was faring better than most. I decided to return to my original stretch and hope there were more fish around, or that the fish I lost might get over its inevitable sulk quick enough to be tempted by a different type of bait (if ever I lose a pike on a certain bait, or have a follow on a certain lure, my default response is to try a different bait/lure, which they may not view with as much suspicion as they would seeing the same one again). Despite a free-roving float - which I was drifting around the canal with the wind - bobbing encouragingly a few times as dusk approached, it wasn't to be my day and I left cursing the fact that I really f***ed up when it mattered most and lost what I think was a very decent pike. Before I could get out again, the final week of the river season was upon me. I only had time to go fishing once after work that week. Conditions seemed perfect for barbel and I had some new boilies I wanted to try out, so I headed to the Derwent. The weather was mild for the time of year so instead of heading to the deeper holes and runs that I'm usually tempted to try in February and March, I tried a swim which had shallows immediately upstream of it, and dropped to a maximum depth of around 6 feet mid-river. The water pace is pretty fast here, so it's not the kind of place I'd expect to find barbel when it's really cold, but with night-time temperatures hovering around double figures, there was every chance the fish could be hard on the feed in somewhere just like this. Having lost a bit of faith in the baits I'd been using (I started to question the freshness of the shelf-life baits which seemed to have a more sour aroma than when I'd bought them previously) and only landing a couple of chub on luncheon meat all season, I was eager to try something new. I'd heard good things about The Hook Bait Company, so I ordered a few different flavours of their freezer baits in 14mm & 16mm dumbbells. I also opted to switch from a large swimfeeder to a small lead, just enough to hold bottom. The main reason for this is that with the heavy floods many anglers had stayed at home. Any rigs that were cast into the rivers would have landed in several extra feet of coloured floodwater, so as they landed they would probably go unnoticed by the barbel. Therefore the barbel would have had a very quiet few weeks of getting used to not being bombarded with heavy feeders and leads. Now the rivers had fined down and the water was quite clear, any large splashes would most likely be viewed with suspicion, possibly putting the barbel off the feed or causing them to move out of the swim altogether. I still wanted a bit of scent going into the water, so I made up some small PVA stockings of groundbait, a few pellets and a couple of crumbled boilies then attached them to my rig with the very handy Avid Carp PVA metal link. I baited each rod with a 3-B boilie and a Big Squid boilie and put them out mid-river, one in the deeper part and one at the bottom of the rapids, where it just started to deepen off. It was 8pm by the time I got both rigs into the water, which was disappointing as I knew this would be my last session of the season and I may have already missed the main feeding spell. I doubted whether I could face another blank and where it would leave me if the season ended without me banking a fish during the first 3 months of 2014. Still, I knew I could do nothing more so I sat back in wait, enjoying the mild late winter evening. Twenty minutes later the downstream rod tip careened towards the water. Unmistakably a barbel bite! It had been a while since I'd hooked anything, let alone a barbel, so it was a fantastic but slightly unnerving sensation to feel something take line at speed. I couldn't do anything with it at first, the clutch was already as tight as I dared have it, but as far as I knew there was open water in front of me (Although anything could have been deposited by the floods.). It took at least a minute, but it felt much longer, before I could get the fish under control enough to regain any line. I started making headway and got the fish halfway back to me when I felt a bump and everything went solid. My worst nightmare! I didn't know what snag the fish had found, but it didn't feel like I was going to be able to move it (It was probably a submerged clump of Norfolk reeds!). I started shaking, knowing that I had hooked something decent which could save the end of my season, but I was now within one wrong move of losing it. I tried to remain calm so I didn't do anything rash, like I'd done on the pike session, and after maintaining contact and pulling from as many different angles as I could I decided my best chance would be to slacken off for a few seconds and hope the fish moved off. To my relief after trying this a couple of times the rig came free of the snag and lo and behold, it was still attached to the fish! I didn't want to take anything for granted now and tried to play the fish in as quickly as possible. After a few near-misses close to the landing net, the fish was safely nestled within it. First cast with the new baits and I'd landed what was clearly my best barbel of the season and it looked like it should definitely make double figures. 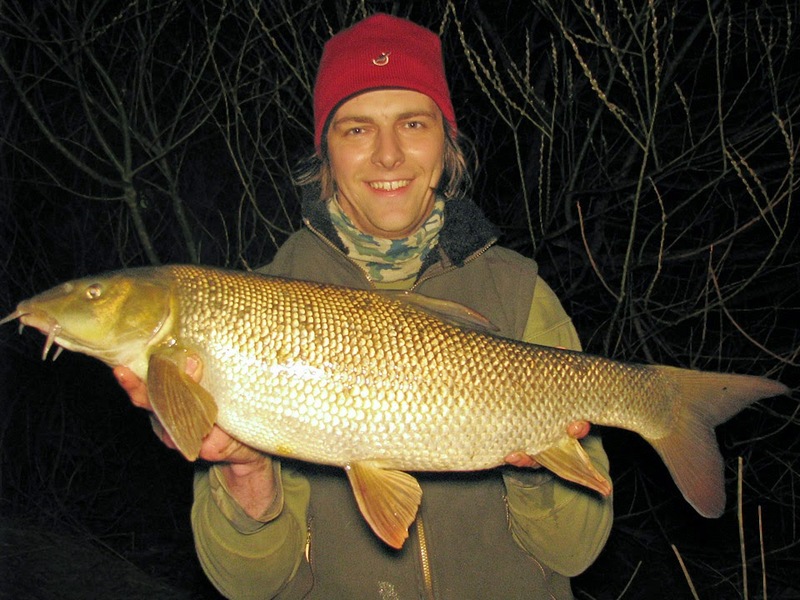 The weighing confirmed I'd landed my first double figure barbel of a disappointing barbel season, at 10lb 9oz. I cannot tell you the relief to catch a decent fish on my final attempt and to make it all the more special, it gave me such a memorable scrap. Hopefully next season the rivers will be kinder to me, but when I look back at last season it won't seem quite so bleak as I it might.